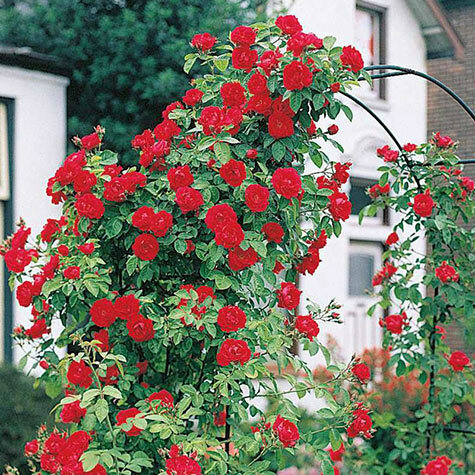 Blaze Improved Climbing Rose | Gurney's Seed & Nursery Co. 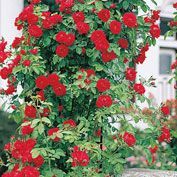 Vigorous climber grows 10-15 ft. and is gorgeous on a trellis or arbor. Plants are loaded with blossoms in June, bloom continues intermittently all summer, then finishes up the season with another heavy bloom period in early fall! An easy-to-grow variety. Zones 5-9. No. 1 to 1 1/2 grade. Depth: Plant with bud union at soil surface or 2 inches below in cold climates. Blooms: Everblooming - early Summer to early Fall. Zone: 5 - 9 perrenial. Flower Form: 2 - 3 inch, repeat, free blooming flowers. 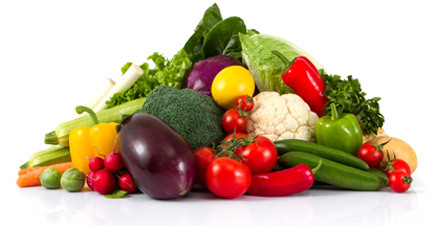 Soil Requirements: Well-drained, loamy, moist soil. Pruning: In Spring to remove old dead wood annually. 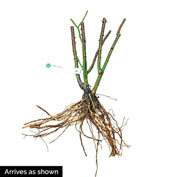 After bloom, remove spent flowering laterals to between 2 - 3 buds of remaining branch. Time of pruning is early Spring after flowering. Comments: Improved version of Blaze. Blooms are at the heaviest in June and early Fall.